The SBB1 was designed to be compact, to allow easy fitting in confined spaces. Featuring 8 buttons (six single buttons, plus the two rotaries are also push-buttons!) and two rotary encoders, the SBB1 is built with our usual high-quality components and constructed in our multilayer method to ensure a beautiful and long lasting finish. The unit is Fully USB Plug n Play, just plug it in and go, no software needed, we configure the unit for you and supply everything needed, complete with mounting hardware. IMPORTANT! 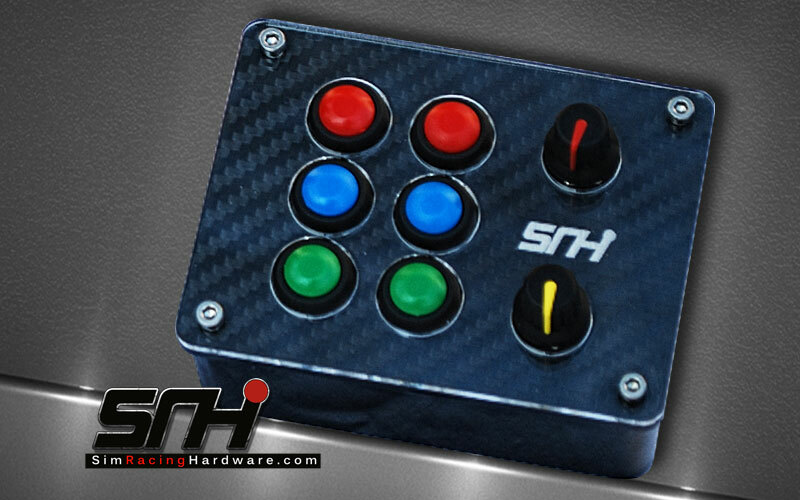 : This Button Box will ONLY work with pCars (Project Cars) and any other game that allows the use of a HID USB wired keyboard (normal PC USB keyboard) as a second controller. Category: PlayStation 4 Products. 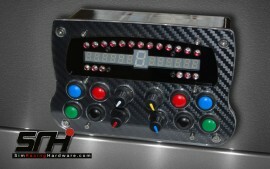 Tags: CSW, Custom Dashboards, Dshboards, SBB2 Button Box. A new concept in Xbox One simulator controls, the wheel based dashboard is a superior and immersive, yet simple way to add extra controls and realism to your Xbox sim! 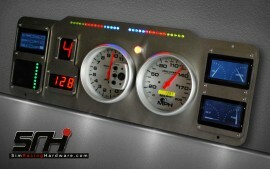 Gain the advantage of easier and more comprehensive ‘in game’ adjustments to car and game settings. Our Fanatec CSW dashboard fixes with 4 supplied stainless steel bolts, simply bolt the dash on, plug in the USB lead, and you’re ready. IMPORTANT! 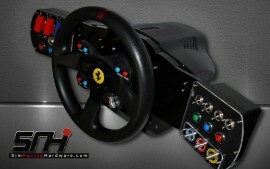 : This Dashboard will ONLY work with pCars2 (Project Cars 2) and any other game that allows the use of a HID USB wired keyboard (normal PC USB keyboard) as a second controller. A new concept in PS4 simulator controls, the wheel based dashboard is a superior and immersive, yet simple way to add extra controls and realism to your PlayStation 4 sim! Gain the advantage of easier and more comprehensive ‘in game’ adjustments to car and game settings. Our Thrustmaster T500RS dashboard fixes with 4 supplied stainless steel screws, simply un-screw and remove the static paddles and screw the dash on, plug in the USB lead and you’re ready. The unit comes with full instructions and is fully assembled complete with everything you need to fit it and go! IMPORTANT! 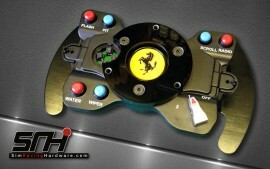 : This Dashboard will ONLY work with pCars (Project Cars) and any other game that allows the use of a HID USB wired keyboard (normal PC USB keyboard) as a second controller. Our Thrustmaster T-GT dashboard fixes with 4 supplied stainless steel screws, simply un-screw and remove the collar ring and screw the dash on, plug in the USB lead and you’re ready. The unit comes with full instructions and is fully assembled complete with everything you need to fit it and go! Built using high-tech components, modern materials and hand finished to create a display / Button Box that not only has superb functionality, but also modern styling! 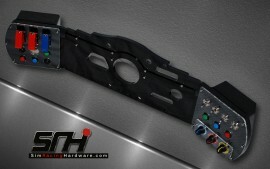 If you want to use an SLI-Pro shift light unit, but can’t or don’t want to wheel mount it, this is the answer. The unit offers a simple but very stylish solution to the problem and incorporates eight high-quality buttons and four rotary encoders pre-installed in to the unit. 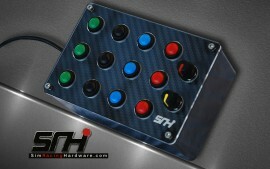 The button box is a ‘FULLY BUILT’ unit, supplied with an SLI-Pro fitted, wired and ready to go. 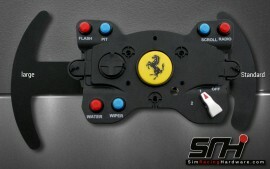 A new concept in simulator controls, the wheel based dashboard is a superior and immersive, yet simple way to add extra controls and realism to your sim rig! 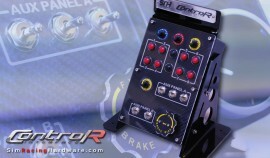 SR Hardware’s Thrustmaster GTE wheel adapter allows you to remove the original wheel rim and fit a REAL racing steering wheel to the GTE plate and paddles. These adapters are drilled to accept 70mm PCD wheels/hubs (the sizes for the majority of modern aftermarket wheels such as Momo etc). They come complete with 3 countersunk bolts to mount your new wheel and longer bolts to fit the adapter to the GTE Plate. These units are not meant for the repeated mounting and dismounting of wheels, we are working on an alloy version with thread inserts for customers who wish to swap wheels on these adapters. 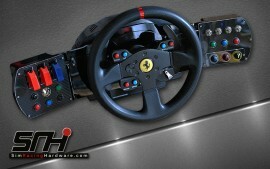 A must have kit for Heel ‘n’ Toe drivers using Logitech’s G25 pedals. 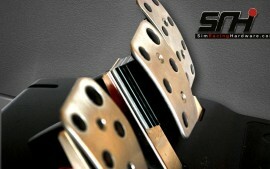 This complete and simple kit allows users to raise the brake (or any other) pedal from 1mm to 20mm in 1mm increments. The kit contains 6 x 3mm and 2 x 1mm beautifully laser cut spacers and a selection of twelve high-quality stainless steel countersunk cap head bolts in various lengths to suit (plus 4 more standard length stainless bolts to replace the originals on the gas/clutch pedals too), with the appropriate Allen key. Extended shifter paddles for the Thrustmaster GTE wheel, made from aluminum alloy, precision cut and then formed and black anodized for a super finish. These are perfect to go with our GTE wheel adapters, two sizes are available, Medium, for wheels up to 320mm and Large for wheels from 300mm and above. Please check the size you need as the desired position of paddles varies with wheels and personal preference. 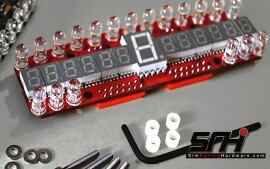 Featuring 14 buttons (12 single buttons plus the two rotaries are also push-buttons!) and two rotary encoders, the SBB2 is built with our usual high-quality components and constructed in our multi-layer method to ensure a beautiful and long lasting finish. stainless nuts, washers and poly spacers to protect your board when tightening the fasteners. No more searching for the right fasteners or using inferior parts or wood screws! We even include a suitable Allen Key. Our Thrustmaster T300 dashboard fixes with 4 supplied stainless steel screws, simply unscrew and remove the hub ring and screw the dash on, plug in the USB lead and you’re ready. The unit comes with full instructions and is fully assembled complete with everything you need to fit it and go! 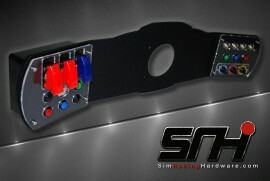 SR Hardware manufacture Simulator Dashboards for Race Teams, Driver Training Company’s and Race Rooms as well as private clients who wish to take their simulation rigs to the next level. Our ability to manufacture using a wide range of materials including Alloy, Stainless Steel, composites and acrylics means we can offer a comprehensive dash building service. Add to this that we can design and manufacture specific PCB’s to suit individual and small production runs means SRH can deliver the item you need! Take advantage of our design teams experience, they can guide you through component selection, material choices, the C.A.D. design phase and finally production of your dream product. Low cost Initial Quotation and Drawing phase (From £35) * Please note this charge is made for the time to make up a costing and initial drawings and is Non-Refundable due to the custom nature of the service. 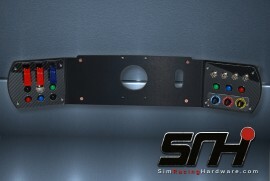 A new concept in simulator controls, the wheel based dashboard is a superior and immersive, yet simple way to add extra controls and realism to your PlayStation 4 © sim rig! Our CSL Elite dashboard fixes with 4 supplied stainless steel bolts, simply bolt the dash on to your Fanatec CSL Elite wheelbase, plug in the USB lead, and you’re ready. IMPORTANT! 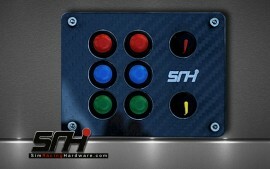 : This Button Box will ONLY work with pCars2 (Project Cars 2) and any other game that allows the use of a HID USB wired keyboard (normal PC USB keyboard) as a second controller. The ControlR features 10 quality push buttons, 5 rotary encoders (including our unique Brake Bias Knob) and 5 toggle switches and is built to the highest standards with our multi-layer carbon look, beautiful laser engraved face plate and colored roundels on the encoders.